Scratches, heat and pressure, fingerprints – these are the common DVD damages. It’s essential to keep your DVD and Blu-Ray compilations in peak condition for your home theater viewing enjoyment. Keep your discs working properly and make your movie collection last for years with these tips on proper care and handling of DVD’s. Handle the discs by the outer edge or the center hole. Store the discs vertically in their case. Keep the playable surface of the disc clean and dust free. Prevent scratches by not bumping into or moving the DVD player – if it gets moved a lot, it receives a vibration that could scratch the disc. Use a non-solvent-based, soft-tip permanent marker to mark the label side of the disc. Check the disc surface before playing it. Store discs in a cool, dry place. Clean the disc using a lint-free cloth and wipe in a straight line – from the center of the disc towards the outer edge. Wipe the discs as gentle as possible. 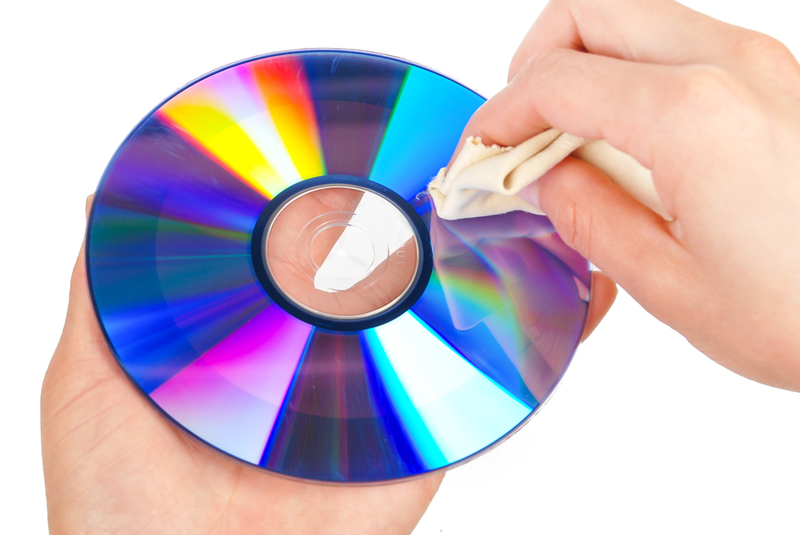 Remove fine scratches with specially designed DVD cleaning products and formulated solutions. Make sure the disc is completely dry before playing or putting it away. Stack discs for a long period of time. Write in the data area of the disc. Rub in a circular motion around the disc. Store discs in paper or cardboard sleeves. Apply adhesive labels to a disc. First, the good news: newer DVD’s and Blu-Ray discs aren’t prone to this sickness because they are made of better materials. DVD Rot refers to the tendency of a CD or DVD (and other optical disks) to become unplayable due to material decomposition. Some of the primary causes include improper inks, poor-quality resin, and the adhesive that holds the two thin layers of the disc together. To check for DVD rot, hold the disc up to a bright light source and examine the surface for very tiny dots of white light – this is the light shining through those tiny holes. To make sure that these holes are a sign of DVD rot, the hole should go through both sides, from top to bottom. Also, the rot becomes noticeable when there is discoloration in the disc. DVD Rot cases seem to be extremely rare, but it’s best to exercise caution and practice the tips outlined above so damages to DVD’s can be averted. If you have a DVD that can no longer be read by your player, don’t throw it away just yet. Check that your TV is set to the correct source to see the DVD image. For example, if you have attached your home theatre to the HDMI jack on your TV, you should select the HDMI source on your TV. You can also try resetting your player by unplugging it and keeping it powered down for about a minute. Lastly, you can use a lens cleaner to clean the DVD lens in your player.